A friend’s 1950’s era Airstream Trailer parked at the LBJ National Grasslands over the weekend. Star gazing and no burn ban, made for a great evening last Saturday night. If you’re a football fan, yesterday had to be nirvana for you. I never saw the light of day yesterday, but was happy to take a break from sorting and cataloging CDs, to watch the NFL championship games. The games were pretty great, and the new commercials are already being rolled out. Did you catch Schwartzenegger’s ping pong outfit? I can remember when that look was cool! Here in North Texas it’s the January doldrums. I am continuing to look for good ponds to lease for guided trips this spring, as the water levels on lakes promise to be an ongoing problem for the near future. That is only one aspect of a radical new approach to successful fly fishing in regions that look like they will be more-or-less drought stricken for many years to come. The only other option, permanent relocation, isn’t an option. Another possibility for successful trips this year will be carp fishing from flats boat or kayak. If the fish aren’t where they were, we have to find them wherever they are. The time is right to get back to work on the Airstream (escape pod) as well, as that will be the home-away-from-home for guide trips and escapes. 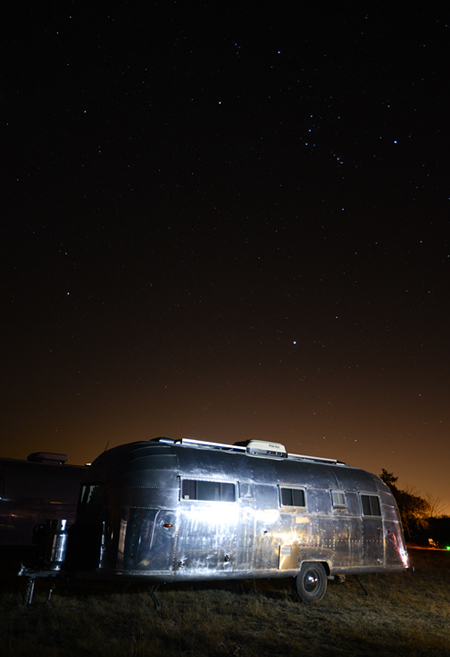 We went out to an Airstream gathering at the LBJ Grasslands (north of Decatur near Black) last Saturday night – to hang out with friends and check out the night sky. Airstream folks are a relaxed crowd, with none of the melodrama that sometimes rears its ugly head at fly fishing gatherings. Let us know if you are doing any fly fishing. I have seen some huge bass being caught on Lake Kiowa recently, but even those have that flat winter coloring, and they’re likely to feel a lot more like a log than a fish on the line. Once the weather primed out last week, I did see that fly fishing guide Captain Billy Trimble did get a client on a 36-inch redfish (after we left) last week. No surprise there (in Port Aransas, TX) as the weather improved to almost perfect winter redfishing conditions. Welcome to wherever you are today! I bet a lot of you are off for the MLK holiday, and we all need at least one holiday a week, don’t we? Wherever you are, and wherever you go – arrive safely this week, and check back here as we tread water through the Bermuda Triangle of Texas winter doldrums. Hey Kay, Finally a real comment! Get a bunch of spammers here due to high traffic. Well, the first thing to do is learn to cast, and that doesn’t require a rod purchase. It’s also a good way to find out if he really wants to pursue it. I’m thinking about getting my son-in-law a rod and reel, etc., for his birthday in mid-March. I know nothing about fishing, but I read the interviews with Tom Morgan, so I know it’s pretty specialized. My son-in-law Roger lives in Mansfield TX, by Dallas and Ft. Worth. He and my daughter and my grandchildren go to lakes, small rivers and streams to hike and picnic, etc. He tells me he has done some fishing. I was going to get a lifetime membership in Trout Unlimited and give him one of the Sage rods with reel that come with the membership, until I read the interviews. What weight rod, length of hand-knotted leader, type and size of fly, type of reel, and so forth would you recommend in his situation? I don’t want to get something he can’t use or that won’t work where he fishes. Also, can you give me an idea of the prices on this equipment?